Today is a special day for one of the OfficeSpace.com team members. Our own John Heimbigner is being inducted to the Athletic Wall of Honor at his alma mater, the noted Catholic Boy’s School – O’Dea High School in Seattle, Washington. John’s athletic contributions to the Fighting Irish soccer team led to a state title and continue today as Regional Director for Seattle United. John will now join the ranks of other alumni who have received this well deserved award of distinction. It looks like you’re in good company John! Congratulations once again to a true team player we’re sending you multiple high fives filled with pride! We hope you have a great O’Dea! Chalkboards and Chairs and Chartreuse Oh My! 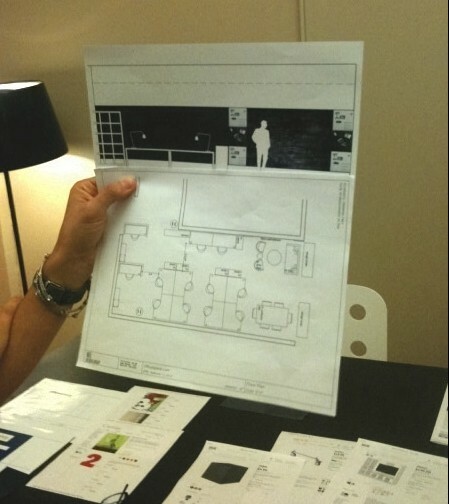 Potential Floorplan (open concept) w/ Chalk “Brainstorming” Wall. Amongst the concerns we laid out in last week’s blog “Movin On Up Part 1” were – what to do with our office furniture and whether or not we should design the space ourselves. Well, it turns out the best laid plans are ones that involve doing a bit of both. 1. For our furniture/supplies dilemma, we referenced Pinterest obsessively and tried to incorporate our own furniture with a few creative ideas from Pinterest ie. Our Chalkboard Wall. 2. We also figured out the most efficient way to get rid of the furniture we couldn’t re-use was to sell it to our neighbors in the same loft space. We already share the same esthetic and neither party had to travel far for deliveries and pick ups. 3. Despite our own in-house decorating efforts we still needed a bit of assistance so we hired a local designer to help walk us through a few things. Keep in mind small budget doesn’t equal 100% DIY. We were still able to bring on a professional who could help tie everything together and offer some affordable solutions. 4. In keeping with our brand identity we’ve decided to add accents like throw pillows and desk supplies in our team colors while keeping everything else “Ikea” white. This keeps costs down, is easy to refresh and won’t look dated in a few years. Next Friday is the actual move and we’re sourcing things like gently used boxes for packing (more enviro-friendly/economical) and looking at how to introduce ourselves into our new subleased space which happens to be shared by a large Seattle web based business who has been kind enough to offer us our new home. Big News! We’re moving offices! Excitement, pride, growth – all good! Suddenly, those feelings were followed up by the pending loom of “ah nuts, moving means packing means boxes means design choices and so on and so on”… Just when we got comfortable and everything had a place. We needed to retreat to the “Living Room”.. Yes, there are many questions we here at OfficeSpace.com have now been faced with regarding our upcoming move. So we thought who better to share them with then you. First we thought, what do we do with everything? Do we bring our old furniture to the new location? Recycle it? Repurpose it? Resell it? Hire a designer vs do it ourselves? We’re a small team with a budget to match so how do we maintain our hip, cool, start up, tech office vibe we pin daily on our Pinterest board? Do you have any office moving horror stories or perhaps any great recommendations or tips? If so, please feel free to send them our way. Has Pinterest Helped Your Business Grow? Pinterest is one of the fastest growing social media websites on the Internet. The mere act of talking about Pinterest is trendy. Penning an article about how to use Pinterest to grow your business-well, that’s even cooler. This is not one of those articles. At OfficeSpace.com, we’ve been reading these articles promising success stories of Pinterest and we, too, have been pinning diligently. We developed a strategy and pinned our favorite offices, office supplies, furniture and photos of spaces featured on our own website. We have 175 pins, 18 boards and 16 followers. These just all seem to be numbers without meaning at this point and we keep having this discussion- so what? There’s talk about what the social media phenomenon is worth if they sell. Forbes thought $7.7 billion last April, but one major question remains: how does pinning actually turn into business? We read about the large affiliate fees that Pinterest earns but not sure how that translates into revenue for us. Sure Pinterest seems like great fun for crafts and food, but what about branding? I always see tips but haven’t heard many success stories. To other CRE-industry folks out there, we’re curious: are you using Pinterest? Do you find that it has made a difference in your personal branding or grown your business? We’d love to hear your stories! For the past week and a half, I’ve been curled up on my couch like an Olympics addict. I’ve even been watching the biographies NBC puts together for American athletes. These segments show the athletes training, past victories, their families and a final huge factor: their coaches. There’s no denying that the coaches are one of the most important people and an ever-present part of the most important meet of their careers. I brought this thought with me to work and to the debate of whether or not a tenant needs a tenant rep broker in a transaction. Athletes don’t make their way up to the podium all by themselves now, do they? Much like coaches, tenant rep brokers provide the experience and guidance and negotiate on the tenant’s behalf. Athletes don’t always make it to multiple Olympics, but coaches are often a familiar face. American track and field star Allyson Felix won her long-awaited gold medal yesterday under the coaching of Bob Kersee. If his name sounds familiar, it’s because he also coached legend Jackie Joyner-Kersee. Coincidence? I think not. That’s not to say there are no newcomer coaches, but no one’s going at it alone. A tenant rep broker provides the experience and expertise in the commercial real estate industry that a business owner is just less likely to have. They know how to “coach” their tenants to the best spaces because they’ve done it before. These Olympics seemed to be the Games of the inquiries. When fencer German Britta Heidemann pounced a decisive hit against South Korean Shin A. Lam’s during a clock malfunction, Heidermann was declared the winner and Lam’s coach immediately filed an appeal. Unfortunately for Lam, she lost her appeal. Over at the O2 arena, gymnasts Alexandra Raisman (U.S.) and Kohei Uchimura (Japan) found themselves/their teams in 4th place. Immediately, their coaches filed appeals complaining that they did not get enough credit in their technical scores. Both gymnasts subsequently won the appeal and made it to the podium, but one noticeable thing is that the athlete keeps their distance. Their job is to perform. Their coaches’ is to fight for them. When tenants hire a tenant rep broker, they are hiring someone to be on their side. The listing broker is looking out for his or her client, so why not have someone look out for you? The tenant rep broker will negotiate the price, terms of the lease and other contractual items. They’ll fight the battles so tenants don’t have to get their hands dirty. The tenant can focus on what they do best: running their business. During women’s diving semifinals, coach Vince Panzano was seen giving American Katie Bell coaching and a pep talk. After gymnast Jordyn Wieber’s (U.S.) low beam score in team preliminaries, she was seen talking to her coach across the arena boundary. NBC speculated he was talking to her about what she needed to do to qualify for the all-around competition above her teammates. It’s the coach’s job to guide the athletes, tell them what needs to be done and to analyze the competition- brokers are no different. Tenant rep brokers hear things in the “biz.” They often have an idea of which spaces are currently highly sought after, which neighborhoods are best and how various property owners may work. At the end of the day, the tenant rep broker works for the tenant. The space the tenant chooses is up to them. No one became the best in the world without a coach and a tenant rep broker will help the tenant find their best space and deal too. By now, we’ve all heard the joke about brokers and the fax machine. It’s no secret that commercial real estate has a dinosaur reputation when it comes to technology but times “they are a changing”- sort of. Some brokers have embraced it while others haven’t. While Facebook- Does it Extend to CRE? pointed to split camps on Facebook and CRE, there is less debate on Twitter, social media’s 140-character microblog. Twitter is a conversation where experts come out on top of an array of business topics including our industry’s very own #CRE. However, not everyone or every top broker is on Twitter: an evaluation of the top 3 brokers (as determined by Co-Star’s annual awards) across 3 disciplines in New York, Seattle, San Francisco, Los Angeles and Chicago showed that none of these brokers had Twitter accounts. 1. They are framing themselves as CRE experts by offering their opinion and feedback on various topics, articles and their own blog. 2. They are using Twitter to promote their Twitter newsletters, blogs and websites. 3. They insert a little personality and conversation to take away some of the “your broker is invested in the sale more than you” façade. 4. They are forging relationships with others. 5. They are creating excellent name recognition with their strong presences online. You often see the same names come up over and over again for recommended tweeters as they align themselves with the connotation of #cre. 2. They are not spamming followers with useless and annoying information and hopefully, not viruses. 3. They are not going off topic: top CRE tweeters are known for their CRE expertise. They are not known for their sports knowledge, photos of their family or anything else. Are you part of the #CRE community yet? If not, no better time than the present to get started and find us @officespace! Facebook- Does it Extend to CRE? There’s been a lot of talk regarding why CRE brokers should not promote their business on Facebook. The main gist: Facebook isn’t a professional network. None of your friends are on Facebook looking for a 5,000sf office or a 10,000sf industrial warehouse. Yes, Facebook is fairly social and personal but on the other hand, as the largest social media engine, Facebook is a perfect branding vehicle for a brokerage firm or individual broker. It’s easy to control content for the most part and is a much more visual medium than many other social media tools. The photo album feature is easy-to-use and links come with a nice preview, even when you are sharing a link from another Page. Coy Davidson and Blanchard and Calhoun Commercial are great examples of broker and brokerage pages with depth. First, create a Page for your professional life. Leave your profile personal so your friends who are interested in CRE can follow you on the Page and you can spare the rest. However, don’t just create a Facebook page because you feel you have to have one. It’s a waste of time to create a page and never use it to communicate with your customers or worse, randomly update it every few months which definitely sends the wrong message. If you have a Facebook page, you’ll want to ensure that it looks as professional and polished as everything else you do. When posting, it’s important to think about customizing your message for Facebook. Even though sites like Twitter, LinkedIn, Pinterest, Slideshare, and blogs provide a way to link back to your Facebook page., you want to post with care. Many Facebook pages look like a mishmash of photos, slideshows, hashtags and bit.ly’s and other items not properly formatted for Facebook. There are few discussions, replies or status updates formulated specifically for Facebook. In short, it looks sloppy and abandoned. Facebook culture leaves very little patience for spammers so you want to think twice before linking your twitter feed to your Facebook feed. If you want to use the same tweet, re-do it for Facebook by taking out the hashtags and leaving the URL text out of the body of the update. Real estate is still very much visual and Facebook leaves much more opportunity for photos. Make use of the photo album feature and facilitate and lead discussions. Facebook’s newest format Timeline lends itself to numerous branding opportunities. Create the perfect Timeline cover, include tidbits about your company history in the timeline and rearrange your featured items along the top right (the “photos” box cannot be replaced). Does Facebook translate for CRE? Yes, absolutely! It’s a great visual social media tool to reach many users. Time might be a premium and there are better websites for CRE specifically, but if you’re going to do it, do it right. We recently completed our beta launch in Portland OR in late January of this year and it went well as far as I could tell. In the first 3 months, we had connected around 350 tenants to landlords, property managers or brokers. Tenants had found space using our site and leases were being executed. There’s nothing wrong with that. The challenge for us, however, had been educating brokers on our new service and how it actually works for parties, the broker and the tenant. Nevertheless, when it came to launching in another city, I didn’t want to execute the same way. What bugged me was despite the email campaigns in Portland highlighting our new service to brokers, I knew at best, only 20% of those emails were being opened. We sent beautiful folders to every broker describing in detail how our service works but I was sure a large percentage of those went unopened and into the recycling or worse into the trash. So, we began brainstorming other ideas. 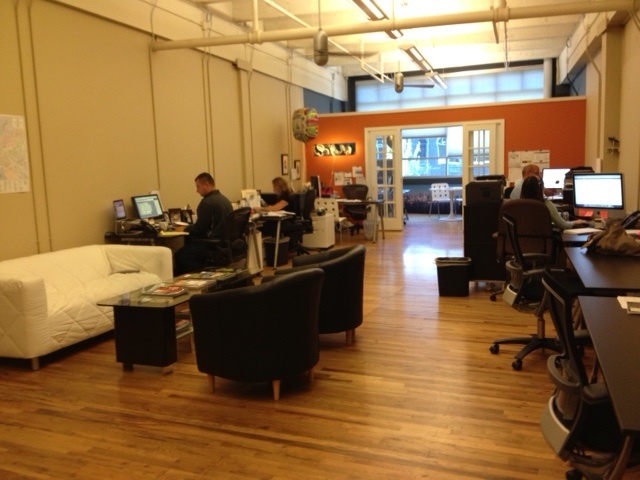 Our goal – to reach every broker and explain exactly what it is we do and again, how OfficeSpace.com can help them. This past week, we announced the launch of our new service, starting in Denver, while we were at an industry trade show. Instead of sending out direct mail, we delivered customized gourmet cupcakes complete with an edible OfficeSpace.com logo to every brokerage in greater Denver – that was over 600 cupcakes in total. I reasoned even though it’s an edible item, certainly people would remember who gave it to them. We built a campaign around our delicious delivery, building anticipation through our social media channels. We created postcards to go with our cupcakes letting everyone know we were celebrating our birthday in Denver – and the cupcakes were free, just like our service. We encouraged our recipients to use social media to tell us how they liked our gift and we waited. I can already definitively say this campaign was much more successful and cost-effective than our first and here’s why: when we began to make our follow- up calls, people wanted to talk to us. They wanted to tell us that they liked our clever idea and more importantly, they wanted to know what the company was doing. If we could be this creative just to get their attention, what would that mean for the types of products we could create to help them? 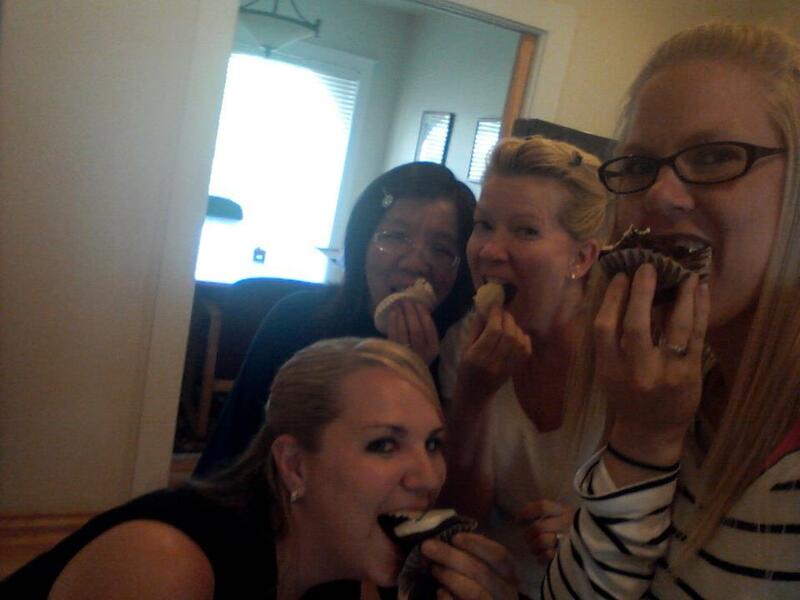 We achieved what direct mail could not: a captive audience (with full tummies to boot!). We’ve been at RealComm 2012 in Las Vegas for the past two days. 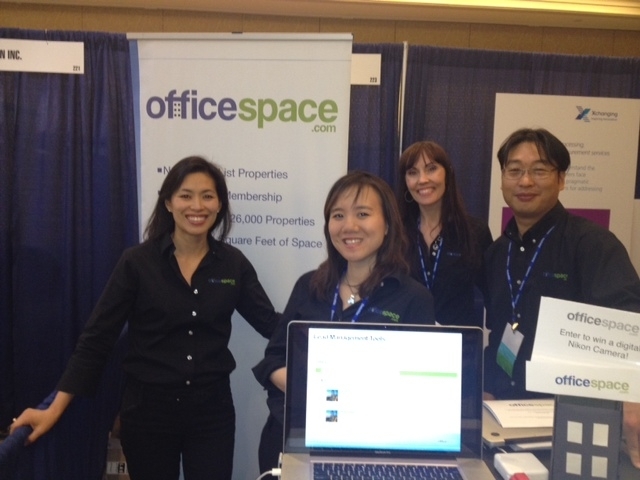 The tradeshow, hosted at the Las Vegas Hotel &Casino, connects real estate with technology, a mission shared equally by OfficeSpace.com. RealComm partnered with IBCom, focusing on intelligent building. OfficeSpace.com had a booth where we met with professionals from Deloitte, Qube, Property Capsule, Sky Foundry and NOI Strategies amongst others. Speaker Robert LiMandri of the New York City Buildings Department spoke at “975,000 NYC Buildings – Embracing Innovation and Setting Global Benchmarks.” LiMandri spoke on the less traditional methods of finding office space. He highlighted “The Development Hub,” a state-of-the-art facility that uses electronic submission of digital construction plans, virtual plan reviews and inter-agency collaboration. LiMandri also spoke of the opportunities for searching for buildings by environmental friendliness including LEED certification. Annual Digi Awards: This year’s Digi Awards included JLL, CBRE, Microsoft and the City of New York, but most intriguing were the individual awards given to Don Goldstein of CBC and Tama Huang of NOI Strategies. Huang was named one of RealComm’s Top 35 People to Watch in 2011 previously and has delivered. We look forward to watching the careers of these winners. RealComm Live: RealComm hosted a video series interviewing heads of companies from Sky Foundry, Property Capsule and OfficeSpace.com’s very own, Susie Algard. Algard went through a web demo of what we do at OfficeSpace.com and announced our Denver launch today at the event. Commercial real estate sure seems to have come along way from its technology dinosaurs reputation and OfficeSpace.com plans to be there every step of the way. Between online listings, construction management technology and cloud-based technology portfolio management, what’s next for CRE technology? A few weeks ago we posted a blog post with a few of our favorite buildings in Portland. We thought it was fun so here are some more beautiful buildings that our photographers have taken shots of. Built in 1872, this Old Town building’s name comes from the fact that it originally housed a market on the first floor and Portland’s first theater on the second floor. The first floor arcade was highlighted by a total of 28 marble produce stalls. For much of the 20th century the building was used to store car parts until 1980 when it was renovated into a retail and office building. Also of note, The Portland Symphony Orchestra was officially founded in 1882 and started in the New Market Theater block. I’m sure The Brewery Blocks need little introduction to any Portlanders. To those reading from elsewhere, The Brewery Blocks were the location of the City Brewery and later the (and more famously) Blitz-Weinhard Brewery from the mid 1800’s to 1999. The oldest buildings remaining were built in 1908, including the Brewhouse Tower. In 1999 the Weinhard brand was sold to Miller Brewing Co. and brewing was subsequently sent to the Olympia brewery in Tumwater, WA. The Brewery Blocks, which by this point had increased to 5 blocks, were put up for sale and in 2000 were redeveloped into a mixed-use project with office, retail residential spaces. The Brewery Blocks’ most famous tenant is Henry’s 12th Street Tavern, which features 100 beers on tap, almost entirely from Oregon. Powell’s Books, while not in the Brewery Blocks, borders block number 2. Originally built in 1872, Smith’s block was just one of nine Portland buildings featuring one of the more popular Portland cast iron patterns. Now, it is the only survivor amongst those buildings. During the 1950’s, the quarter of the building on 1st and Ash was torn down and turned into a parking lot. Despite this loss, the rest of the block remains and has been restored as recently as 2008. Stay tuned! More to come and as always, send us your suggestions PDX!